The blue-throated barbet (Psilopogon asiaticus) belongs to the family Megalaimidae under the order Piciformes. The family Megalaimidae was first introduced by Edward Blyth (23 December 1810 – 27 December 1873), an English zoologist, in the year 1852. The Megalaimidae contains subfamilies Megalaiminae and Caloramphinae. 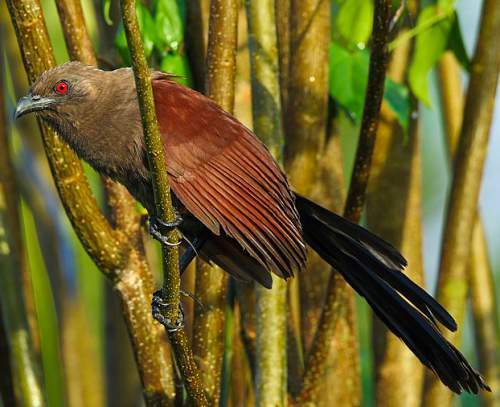 It includes two genera, Psilopogon and Caloramphus, divided into 34 species. The genus Psilopogon was introduced by Dr. Salomon Müller (April 7, 1804 – December 29, 1864), a German naturalist, in the year 1836. Earlier, this genus used to include a single species Psilopogon pyrolophus. The species under the genus Megalaima were found to be similar to Psilopogon pyrolophus and all of them were brought under genus Psilopogon. The species Psilopogon pyrolophus is retained as type species of this genus. The species P. pyrolophus was first described (as Trogon asiaticus) by John Latham (27 June 1740 – 4 February 1837), an English physician, naturalist and author, in the year 1790. The P. pyrolophus is polytypic and includes two subspecies. Current topic in Birds of India: Blue-throated barbet - Psilopogon asiaticus photos. The blue-throated barbet (Psilopogon asiaticus) belongs to the family of Asian barbets, the Megalaimidae. The blue-throated barbet species is distributed in Pakistan, India, Nepal, Bhutan, Bangladesh, Myanmar, Thailand, Laos, Vietnam and China. 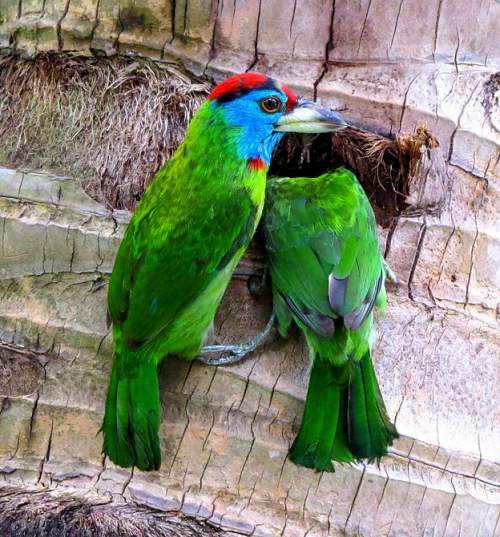 These barbet species have bright green, blue and red plumage. These barbets are polytypic species. The blue-throated barbet (Psilopogon asiaticus) is a medium-sized barbet, measuring 20 to 25 cm in length and weighing 60 to 100 grams. The overall plumage of this blue-throated barbet is green. The face and throat are bluish. There is a red forehead and black-edged red cap. There is a pale bluish patch between the forehead and the cap. There are two small reddish patches on the throat. The back, wings and the uppertail of the blue-throated barbet are green. The underparts are yellowish green. The undertail is bluish green. Both the sexes look similar. The juveniles have paler plumage. The bill is heavy and fringed with bristles. The bill is ivory colored with dark patch on the tip as well as the upper side of the upper mandible. The irises are brown. The feet are pale gray. Their call is a fast repeated "tu-tu-tuk" sounds. 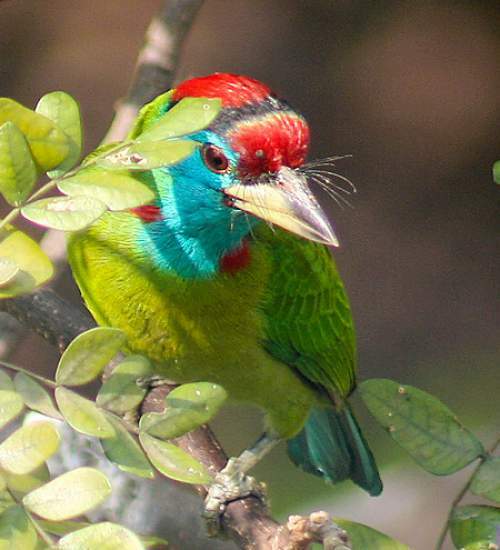 The blue-throated barbet species is distributed in Pakistan, India, Nepal, Bhutan, Bangladesh, Myanmar, Thailand, Laos, Vietnam and China. 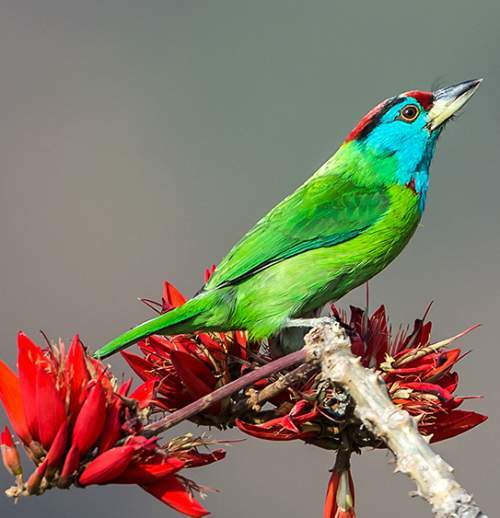 In India, these blue-throated barbet species are distributed in the states of Jammu and Kashmir, Himachal Pradesh, Punjab, Haryana, Uttarakhand, Uttar Pradesh, Bihar, Jharkhand, West Bengal, Sikkim, Assam, Meghalaya, Arunachal Pradesh, Nagaland, Manipur, Tripura and Mizoram. 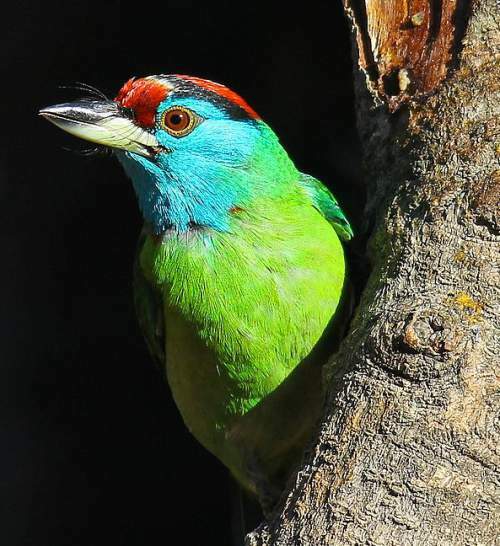 The blue-throated barbet nominate subspecies P. a. asiaticus is distributed in northeast Pakistan, along the Himalayan India, Nepal, Bhutan, Bangladesh, northeast India, north and central Myanmar and south and central China. 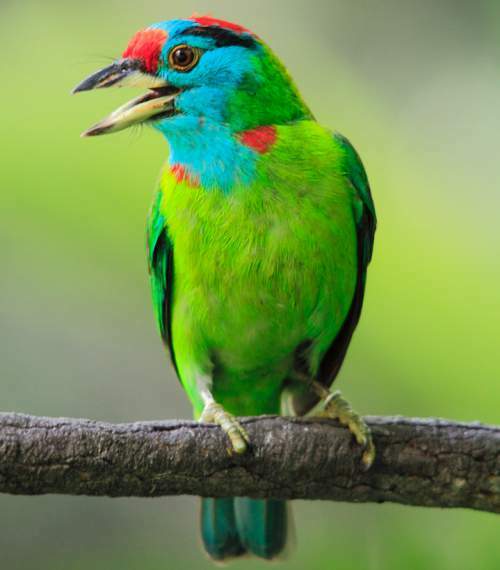 The blue-throated barbet subspecies P. a. davisoni is distributed in southeast Myanmar, Thailand, northern Laos, north and central Vietnam and south and central China. These blue-throated barbet species have moderate forest dependence. They normally occur in altitudes from 200 to 2000 meters. The artificial ecosystems and habitats of these species include plantations, rural gardens, urban parks and orchards. The natural ecosystems and habitats of these barbet species include, subtropical and tropical lowland forests, subtropical and tropical montane forests, primary and secondary evergreen forests and deciduous forests. The diet of the blue-throated barbet consists mainly of fruits. Wild fruits, orchard fruits, berries, figs, flower and buds are their primary food. Sometime they feed on insects including ants, cicadas, dragonflies, crickets, locusts, beetles and mantids. 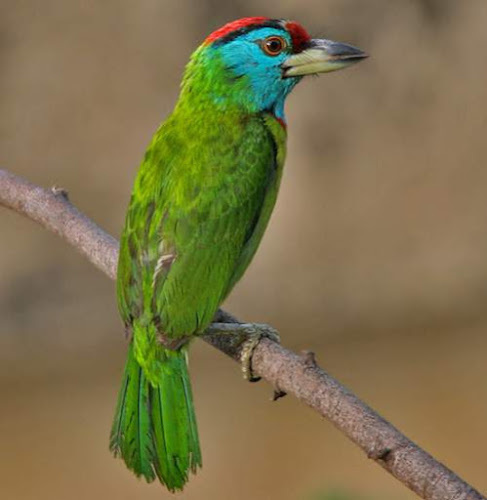 The breeding season of these blue-throated barbet species is from March to July in India. Sometimes two broods are raised in a season. These birds are monogamous and territorial. Courtship includes singing and counter-singing and bobbing of head. 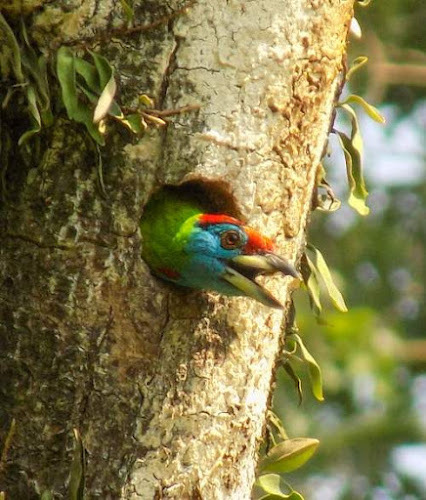 These blue-throated barbet species mostly excavate holes in trees for nesting. The clutch contains two to four white eggs without any markings. Both pairs take turns to incubate the eggs. The chicks hatch out after 13-15 days. These blue-throated barbet species are non-migratory resident birds. The birds in higher altitudes may descent to lower levels during winter. Post breeding, the juvenile barbets may disperse and establish in new locations within the range. They may make local movements for feeding and breeding within their range. 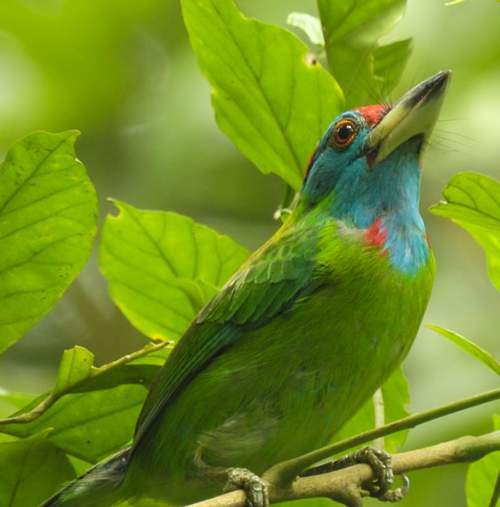 The global population size of the blue-throated barbet (Psilopogon asiaticus) has not been quantified. The overall population trend of the species is considered to be stable. Throughout its range, this barbet species is reported to be common. The generation length is 8.5 years. Its distribution size is about 4,020,000 sq.km. Habitat alteration and destruction, deforestation and trapping for pet-trade are the main threats that are endangering the survival of this barbet species. 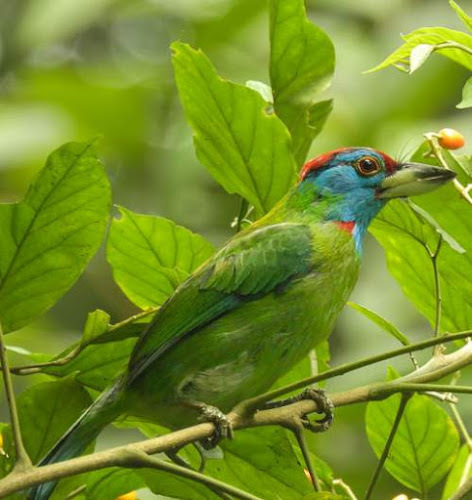 The blue-throated barbet (Psilopogon asiaticus) does not approach the thresholds for being Vulnerable either under the range size criterion, or under the population trend criterion or under the population size criterion. The CITES (Convention on International Trade in Endangered Species of Wild Fauna and Flora) status is ‘Not Evaluated’ for blue-throated barbet (Psilopogon asiaticus). The blue-throated barbet (Psilopogon asiaticus) is closely related to the turquoise-throated barbet (Psilopogon chersonesus), moustached barbet (Psilopogon incognitus) and Annam barbet (Psilopogon annamensis). The two recognized subspecies of Psilopogon asiaticus are: Psilopogon asiaticus asiaticus (Latham, 1790) and Psilopogon asiaticus davisoni (A. O. Hume, 1877). Current topic in Birds of India: Blue-throated barbet - Psilopogon asiaticus. The spotted owlet (Athene brama) belongs to the family of owls and owlets, the Strigidae. The spotted owlet species is distributed in Iran, Pakistan, India, Nepal, Bhutan, Bangladesh, Myanmar, Thailand, Cambodia, Laos and Vietnam. 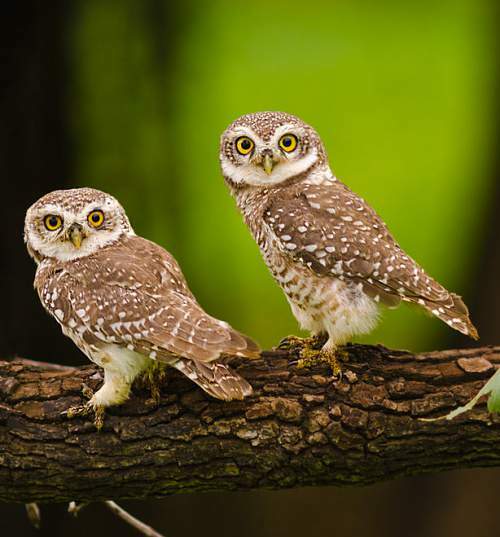 These owlet species are resident birds and have adapted to live near human habitation. These owlets are polytypic species. The spotted owlet (Athene brama) is a small owlet with rounded head, measuring 18 to 20 cm in length and weighing 100 to 115 grams. 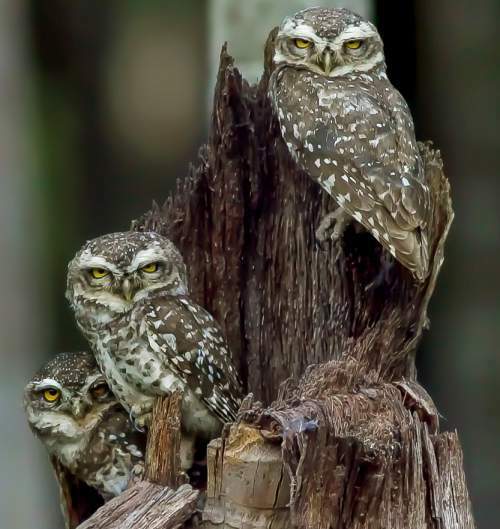 The overall plumage of these owlets is shades of brown. The brown head is heavily spotted white. The facial disc is dark and there are curved white eyebrows. There is a white neck band. 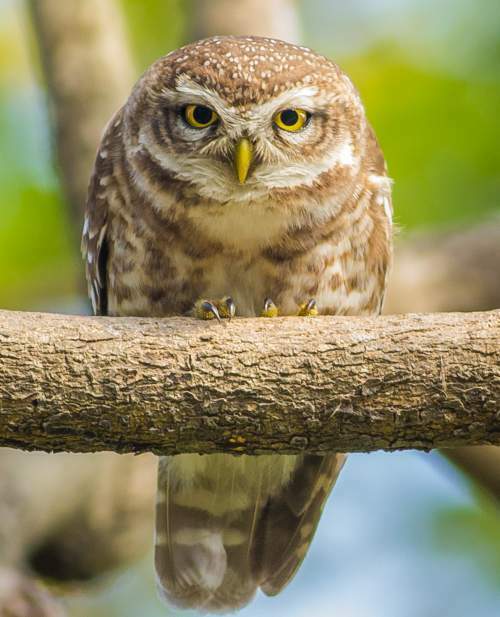 The upperparts of the spotted owlet are grayish brown or brown. The underparts are white with brown streaking. Both the sexes look similar. 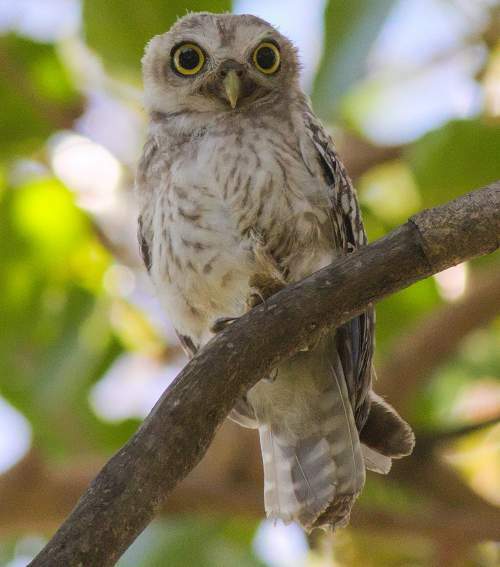 The juvenile owlets are more whitish with lesser spots and streaks. The bill has downward curve and is pale yellow. The irises are bright yellow and there is a dark blackish brown eye-ring. The legs and feet are covered with whitish feathers. The call of these owlets is a harsh and loud churring and chuckling "chiurr..chiurr..chiurr" sounds. The spotted owlet species is distributed in Iran, Pakistan, India, Nepal, Bhutan, Bangladesh, Myanmar, Thailand, Cambodia, Laos and Vietnam. 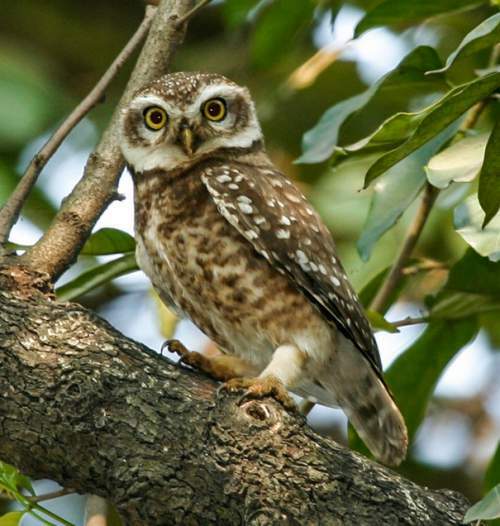 The spotted owlet nominate subspecies A. b. brama is distributed in southern India. 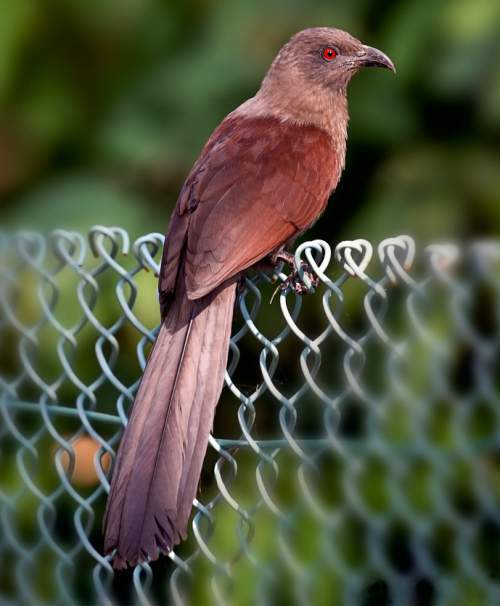 The subspecies A. b. ultra is distributed in northeast India. The subspecies A. b. pulchra is distributed in central and southern Myanmar. The spotted owlet subspecies A. b. indica is distributed in Iran, Pakistan, north and central India, Nepal, Bhutan and Bangladesh. The subspecies A. b. mayri is distributed in north and east Myanmar, Thailand, Cambodia, Laos and Vietnam. 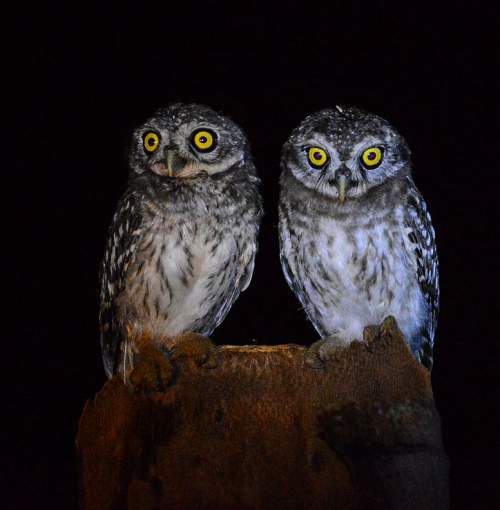 These spotted owlet species have low forest dependence. They normally occur in altitudes from 0 to 1500 meters. The artificial ecosystems and habitats of these species include cultivated lands, flooded agricultural lands, pasturelands, thickly covered gardens and heavily degraded forests. The natural ecosystems and habitats of these owlet species include, subtropical and tropical open lowland forests, semi-open country, semi-deserts and hot deserts. The diet of the spotted owlet consists mainly of insects. Grasshoppers, crickets, beetles, moths, insect larvae, toads, small frogs, lizards, small birds and small rodents are their primary food. The breeding season of these spotted owlet species is from February to April in northern India. The laying season is from November to April in southern India. 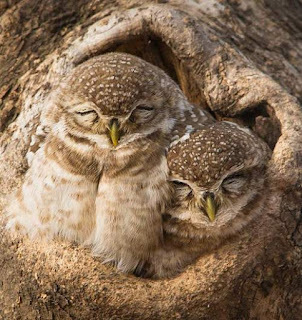 These spotted owlet species mostly use tree cavities and holes found in buildings and man­made structures for nesting. They prefer well branched densely foliaged trees. Dalbergia sissu, Acacia nilotica, Butea monosperma are some of the preferred tree species. The clutch contains two to five roundish oval, milky white eggs without any markings. Both pairs take turns to incubate the eggs. The chicks hatch out after 25-30 days and fledge after 25 days. These spotted owlet species are non-migratory resident birds. The birds in higher altitudes may descent to lower levels during winter. The global population size of the spotted owlet (Athene brama) has not been quantified. The overall population trend of the species is considered to be stable. Throughout its range, this owlet species is reported to be common. The generation length is 4 years. Its distribution size is about 10,800,000 sq.km. Habitat alteration and destruction and capture of adults and juveniles for pet-trade are the main threats that are endangering the survival of this owlet species. The spotted owlet (Athene brama) does not approach the thresholds for being Vulnerable either under the range size criterion, or under the population trend criterion or under the population size criterion. The CITES (Convention on International Trade in Endangered Species of Wild Fauna and Flora) status is ‘Not Evaluated’ for spotted owlet (Athene brama). The spotted owlet (Athene brama) is closely related to the little owl (Athene noctua) and the boreal owl (Aegolius funereus). 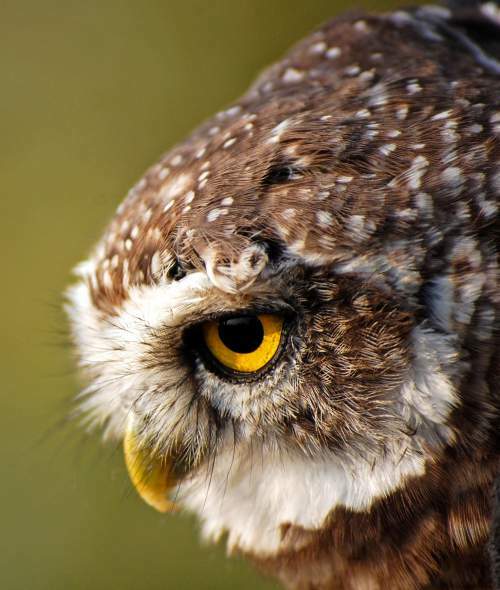 The five recognized subspecies of the spotted owlet (Athene brama) are: Athene brama brama (Temminck, 1821), Athene brama indica (Franklin, 1831), Athene brama ultra Ripley, 1948, Athene brama pulchra A. O. Hume, 1873 and Athene brama mayri Deignan, 1941. 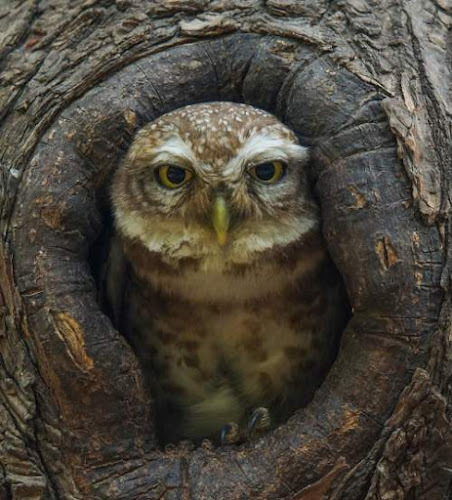 Current topic in Birds of India: Spotted owlet - Athene brama.